It’s sweltering. Radio DJ Mister Señor Love Daddy (Samuel L. Jackson) is proclaiming it to be one of the hottest days of the summer. It’s too hot to work, but Mookie (Spike Lee) makes his way to Sal’s Pizzeria anyway. As he walks, we grow accustomed to the vivid hustle of urban life in one Bedford-Stuyvesant. This little strip of humanity teems with culture and conflict. 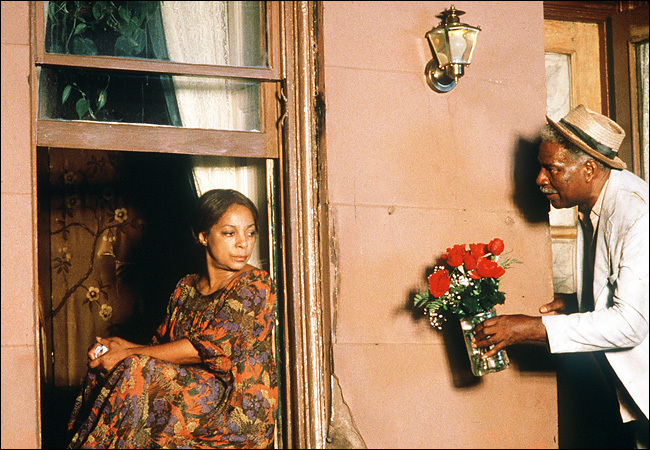 Mookie is greeted by Da Mayor (Ossie Davis), self-proclaimed mayor of the street whose wisdom and kindness is marred by his perpetual drunkenness, as well as Mother Sister (Ruby Dee), the kindly hawk who watches over the neighborhood from her stoop. We see children playing with chalk and teenagers listening to the boombox and passing around beers. 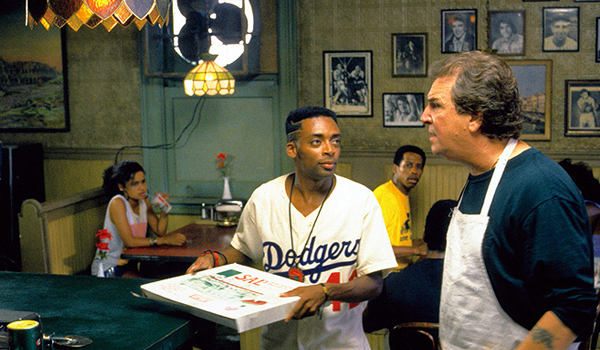 By the time we reach the pizzeria, we have been drawn into Spike Lee’s world and his zany, colorful characters. Sal (Danny Aiello) is a middle-aged pizzaiolo who prides himself upon his restaurant’s place as the heart of the neighborhood and for his strong Italian American heritage. Like many diners across America, the pizzeria has a Wall of Fame, but Sal refuses to allow anyone other than bona-fide Italian actors like De Niro and Pacino on his wall. This irks Mookie’s firebrand friend Buggin’ Out (Giancarlo Esposito), who demands to see some “brothers” on the wall. Mookie and his friends are sneered at by Sal’s son Pino (John Turturro), who makes no attempt to hide his prejudices, and quietly supported by the more open-minded Vito (Richard Edson). Sal himself straddles the line between tolerance and racism – when calm he defends his exclusively black clientele, but when enraged he spews forth a torrent of epithets and intolerance. There is one particularly memorable episode in which Mookie’s black sister Jade (Joie Lee) enters the pizzeria and is treated to Sal’s fawning affection. The camera cuts and zooms as if in a kung fu action movie to reveal both Mookie and Pino’s eyes narrowed. Across the street sit three men (Paul Benjamin, Frankie Faison, and Robin Harris) who drink, tell each other their plans for opening a store, and embark upon angry tirades against the successful Korean grocer (Steve Park) adjacent to them. A young mentally impaired man named Smiley (Roger Guenveur Smith) hocks photos of Martin Luther King, Jr. and Malcolm X. He’s joined in marching back and forth up and down the block by Radio Raheem (Bill Nunn), who refuses to blast anything but “Fight the Power” by Public Enemy. There’s a great scene that purposefully evokes Robert Mitchum’s serial killer in The Night of the Hunter, in which Radio Raheem tells us the ol’ story of right hand, left hand – his brass knuckles labelled ‘love’ and ‘hate’. The film is also notable for the screen debut of Rosie Perez, who plays Mookie’s screechy Latino girlfriend Tina – who’s also the mother of his child. By my count, that’s sixteen major characters. Lee’s film could be like so many others that attempts to tackle the issue of race – lesser entries that, quite often by accident, vilify whites as a whole, or worse still overemphasize their contributions to the civil rights movement by centering the story around a “just white man who sees the evils of society” instead of the triumphs and struggles of the victimized themselves. There are no villains in Do the Right Thing, but there aren’t any heroes either. Mookie and Sal are both immensely tragic characters. Both are poor fathers desperate to become good ones – Mookie by earning a decent salary, and Sal by providing a future for Vito and Pino. Mookie is driven by this desire, but he feels little real attachment for his girlfriend Tina nor his son. Mookie is cared for and looked after by Da Mayor and Mother Sister, who serve as a paternal and maternal figure to him, respectively, but Mookie bats them away every time he sees them. Sal, too, has become a surrogate father figure by providing Mookie with a steady job and a certain level of trust and respect. Ultimately, however, Sal squanders his relationship with the neighborhood and his future relationships with all three sons – literal and symbolic – are left uncertain. The much-discussed and highly controversial finale is an absolute tour de force in filmmaking. Each shot is perfectly placed, each rhythm perfectly paced. There are three major movements in the climax. The first is an assault on culture, the second on humanity, the third on loyalty. There are some who claim the ending is “troubling,” and that Lee rationalizes racial violence with Do the Right Thing. If even for one second you could be misguided enough to think so, one look at Ruby Dee’s tear-trodden face will tell you you’re supposed to be crying, too. Spike Lee’s direction across the film is heavily stylized and delightfully fresh, even after twenty-three years’ status as a classic. One is reminded of Orson Welles and his landmark masterpiece Citizen Kane – both Welles and Lee wrote, directed, and starred in their films, and both were fond of canted angles. Where Lee succeeds the most, though, is in tapping into the feel of this time and this place. The sticky, soppy weather permeates our own pores over the course of the film, largely thanks to the vibrant color scheme of the production design. When the block’s residents unleash a fire hydrant on the city streets, the joy is palatable and contagious. FINAL SAY: Do the Right Thing is quite possibly the best film about racism ever made – the rare film that’s timeless and topical, entertaining and blistering, and completely unforgettable. Previous ArticleWisteria Giveaway: Win a $100 Gift Card! Next ArticleTV Review: Gossip Girl 6x07 - "Save the Last Chance"